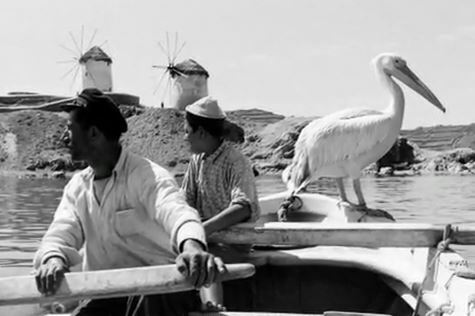 In 1958 a local fisherman from Mykonos found a wounded pelican off the coast of the island. Rather than leaving it to its fate, he returned to Mykonos with the bird, which was then nursed back to health, given the name of Petros by the islanders and adopted as the island’s mascot. Most great white pelicans enjoy a life expectancy of between 15 and 25 years. Petros must have had a whale of a time on Mykonos as he spent 27 years there, until, rather sadly, he was hit by a car and failed to recover. There’s no record of what happened to the motorist but given that the whole island went into mourning for the bird, his life must have become pretty uncomfortable. Word of the accident spread. Hamburg Zoo provided a replacement pelican. So too did Jackie Kennedy-Onassis. At this point our hapless motorist must have been completely mortified. To add to his pain the islanders adopted another ‘local’ pelican. So now there are three Pelicans on Mykonos called Petros. Mykonos suits the pelican lifestyle. A social and cooperative bird, the great white pelican eats early in the morning to allow enough time later in the day for preening and bathing. Groups of birds bathe in shallow water, ducking their heads and bodies beneath the surface of the water and flapping their wings. Pelicans often stand on sandbars and small islands with their wings spread and bills open, to cool down. With a few adjustments this could easily be a description of how your holiday might pan out at the Grace Mykonos Hotel. 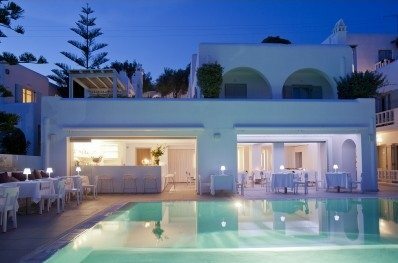 This intimate, bijou and exclusive boutique hotel is just above the sandy beach of Agios Stefanos and a little to the north of Mykonos town, the ideal setting for eating, preening, bathing and chilling. The hotel’s signature breakfast, served all day long in recognition of Mykonos’ reputation for inducing lie-ins, is available at the Grace Restaurant. Mouth-watering, Mediterranean fusion cuisine and gastronomic a la carte dishes are provided too. Refreshment of a different kind is available at the Boutique Spa, where pampering and rejuvenation are also on the menu. The pool provides an effortless setting for sunbathing, relaxing and taking in the view, withsun-loungers as well as king-sized sun-beds offering the ultimate basking experience. The attentive pool-side staff ensure that every wish is catered for. Occasional frozen fruit juice shots or iced towels treats are dispensed. Rooms maybe compact but beds are king sized and the showers huge. Bathrooms are generously stocked with all manner of Apivita goodies. Junior suites add a terrace with plunge pool and a little more space. For the ultimate in gracious living, try one of the four VIP suites, each excelling in a different way. Peace, privacy and luxury, with service that is second to none. That’s what the small but superbly formed Grace Mykonos has to offer. Plus stunning views of the sparkling Aegean. Look closely enough and you might spot a pelican or two, preening , bathing or just chilling. Have you ever been to Mykonos? If so, did you get to see the famous Petros?